They call Booths the Waitrose of the north. But in reality, it feels more like Harrods’ food hall has moved into Morrisons’ Market Street. With just 29 supermarkets across the north of England, the family-run multiple is a blend of classy independent-style retailing and the familiar aisles, trolleys and shiny floors of a major supermarket. Islands of wine are artistically positioned in wooden crates around lavish fresh fish and meat counters, and fresh vegetables being sprayed with mist at regular intervals to keep them looking lush. In Booths’ Knutsford, Cheshire, store, the licensed section feels almost like a maze leading to a circular space in the middle, with a massive By The Glass system as its centrepiece, offering 64 wines to taste. Sampling machines are currently being tried out in a number of Booths stores, first with staff operating it and then with the opportunity for customers to pour their own tasting samples – strictly limited to 1cl. The results of the trial have yet to be analysed, but preliminary findings are that 90% of people who try a few samples will buy a bottle of wine. It is all about the experience for Booths’ buying manager John Gill. He wanted to take some of the most exciting things independent retailers are doing and convert them to a supermarket environment – and that is exactly what he has done. It is not just the sampling machines. Beer and cider aisles have dedicated tasting tables where bottles are opened daily and served in proper glassware rather than paper cups. But instead of hovering over customers as they taste, staff have been asked to leave them to it – but be on hand when they are wanted. 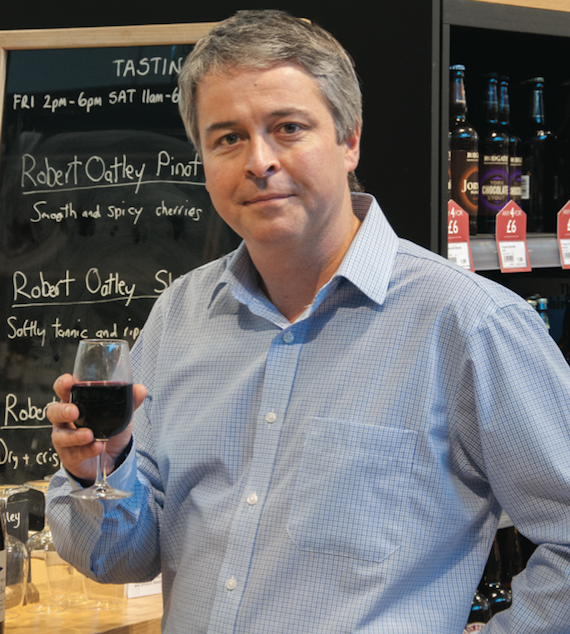 In shops which have cafés, canapés might be offered alongside beers and wines on taste, and the chain has invested in training two full-time workers as wine advisers in each store, so there is always someone on hand to offer expert advice. Gill says: “The idea behind the whole project is to improve service for the customer and give them a real experience of wine when they come into our stores. We have a vision to take the best of what independent wine sellers do and combine it with a supermarket environment – the best of both worlds. This year Booths revamped its annual wine fair with the Big Wine Event in October and early November. Instead of promoting wines it already stocked, Gill bought in 114 special parcels. A brochure published for the event highlighted the limited stocks, and a number of lines were price-checked as cheaper than Majestic, with 1.2 million copies printed. They also braved some eye-wateringly expensive lines – including 18 bottles of Henschke’s Hill of Grace Shiraz 2005, at a whopping £395 a bottle. The fair coincided with a store-wide revamp of own-label, and 24 new wines were introduced, bringing the range to 30 – all of them European. Gill says: “We always had a good range of sherry, a claret, Côtes du Rhône and one Champagne, but we decided we should really invest a little bit more. We set off with one of our key suppliers to make sure we could keep the quality and offer customers something a bit different. We tick a few of the big boxes – the biggest seller is Prosecco – but things such as a Verdicchio for £6.39 have gone really well. “We tried top end such as Châteauneuf, but couldn’t get the wow-factor, so instead we have Séguret, a little village that has proved really popular, and a Pinot Noir from Alsace that has really taken customers by surprise. The wines are priced from £6.39 to £13.49 for still wines and £33.99 for vintage Champagne. Overall the wine range is refreshed every six months – last year 100 new lines were brought in to keep it fresh. 2011 for his pioneering work with bottled beers and ciders and Gill has taken over from him with passion. He says: “We have had a great year for beer, and really focused on bringing lots of new and interesting beers into the range. We try to balance unique, special craft beers, ciders and lagers alongside more mainstream ones, as our customers want both. A comprehensive range of 220 British premium bottled ales – with local beers included in each store – sits alongside an exciting array of world beers and ciders, from craft to conventional. To encourage shoppers to try something new, 95 beers and ciders are currently included in four-for-£6 multibuy offer. Staff are encouraged to offer customers tastings, and a whole fixture is devoted to party kegs, some of them bespoke and exclusive to Booths, including Thwaites Wainwright and York’s Rudgate Jorvik Blond. “It is great to work with smaller brewers who can push the boundaries a bit. Sales have been phenomenal and will really ramp up between now and Christmas,” says Gill. Booths’ spirits range is as eclectic and high-end as its wines, with a focus on gin and malt whisky, but this year the retailer has been ramping up its vodka range with some more unusual offerings, such as British Chase vodka, made from potatoes. The move was part of a full range review which also doubled the gin range. Whatever they are doing, it is working. Wine sales have grown 4% since January. Beer sales have also grown by 4% this year, reversing a decline last year, and spirits are up 8%. As a family-run company, Booths is sticking with organic growth and, although it is growing as a business, it has no plans to expand beyond the north. The mission now is to get more customers through the doors, and the store has launched a customer loyalty card as part of that bid. Customers who are in the scheme get extra discounts on wine, and it is linked to the company’s social media push (see box). “We are predicting the best future yet for 2014,” says Gill. “We have had a really good year for licensed off the back of a good summer, but we have also created a platform which will mean an even better year next year. We will take the best of what we have done this year and magnify it. If it didn’t perform in some areas we will try to amplify that.